In the first week of January, United Kingdom and Denmark had the highest flu circulation in Europe, (High in England and Ireland, moderate in Whales and Scotland), followed by Belgium, France, Israel, Italy, Luxemburg, Spain, and Malta. Ukraine and Russia also experienced high flu activity. Most flu isolates are 2009 H1N1. In Japan, there were more flu incidents, mostly of 2009 H1N1 origin. 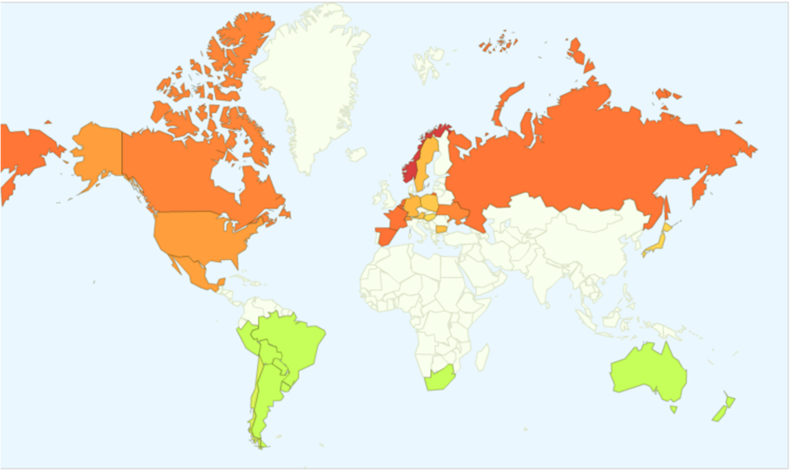 Google flu map predicted lower activity for Japan and highest for Norway, lowest for the Southern hemisphere. In the United States, influenza-like illness (ILI) was down the week before but still above the national baseline. Yet three more states reported widespread flu than the week before, updating the list to: Alabama, Arizona, Georgia, Kentucky, Louisiana, New York, North Carolina, and Virginia. New York City and six states: Alabama, Georgia, Illinois, Louisiana, Mississippi, and Oklahoma reported high ILI activity, Nevada and New Jersey reported moderate ILI activity, and the remaining states reported either low or minimal activity. No antibiotic resistant strains have been found. good Bluestack is the most preferred Android emulator mobdro for iphone We are now able to streams videos on our COMPUTER/ Laptop utilizing Mobdro App nice. I recently discovered your blog and have already been reading along. I thought I would leave my first comment. I don't know what to express except that I have enjoyed reading. Nice blog. I could keep visiting this blog very often.